Bubble Bobble World is a remake of a popular classic game Bubble Bobble. You get to play as one of the two little dragons named Bub and Bob. The action takes place in a totally new world filled with cunning and insidious monsters with a mission to cut their journey short But they have a magic ability to blow bubbles which can entangle their enemies inside of them. Once the enemy is trapped, the bubbles can be easily popped by the little fellows. Bubble Bobble World 1.73 is a shareware program and can be used as a demo to try the software until the free trial period has ended. A full version of the program is available after the trial period ends. For security reasons, you should also check out the Bubble Bobble World download at LO4D.com which includes virus and malware tests. Additional screenshots of this application download may be available, too. 4.5 out of 5 based on 74 ratings. 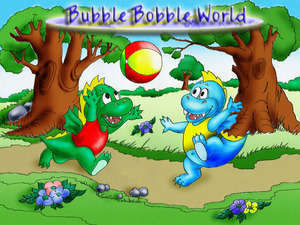 Bubble Bobble World download been highly rated by our users.